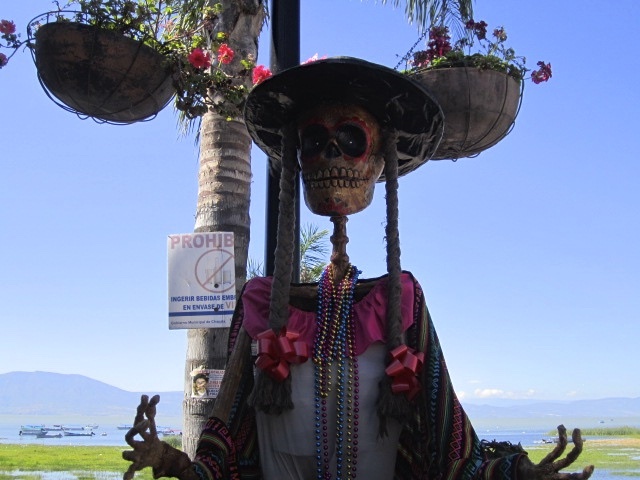 I was a bit disappointed in the Catrina dolls this year, both in Ajijic and Chapala. You can form your own opinion after reading this article and referring back to the one I wrote last year on the same subject. The main problem–not as many as there were last year. 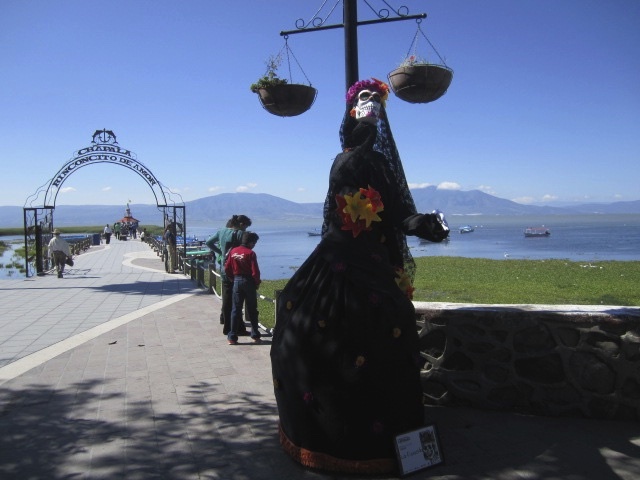 In Chapala last year the dolls were all along the main malecon. 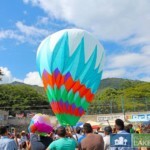 This year, they did not start until the end of the malecon and then over to the newer area. 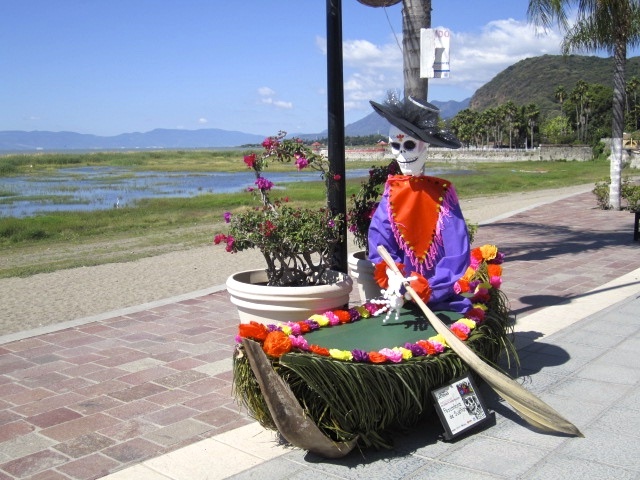 In Ajijic, they were not on the malecon at all. There were just a few and they were located around the bandstand in the plaza. I still enjoyed them and I am going to repeat a little bit of information about the origins of them that I put on the article last year. Just in case you don’t want to go back to that article. 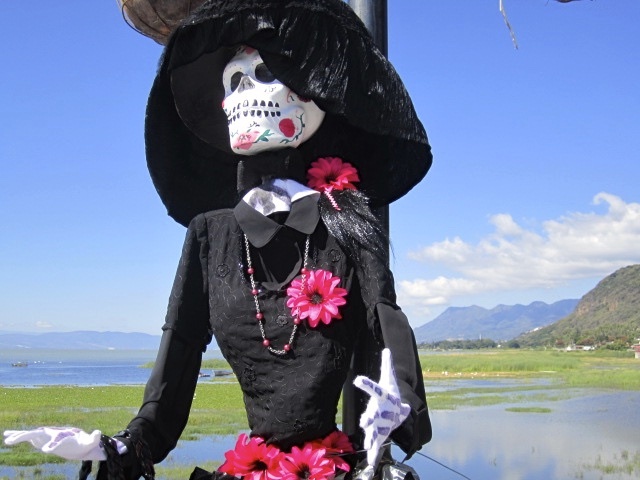 The Catrina, also spelled Katrina, Doll was first created by an artist. His name was Jose Guadalupe Posada and he is known as the father of Mexican Modern Art. 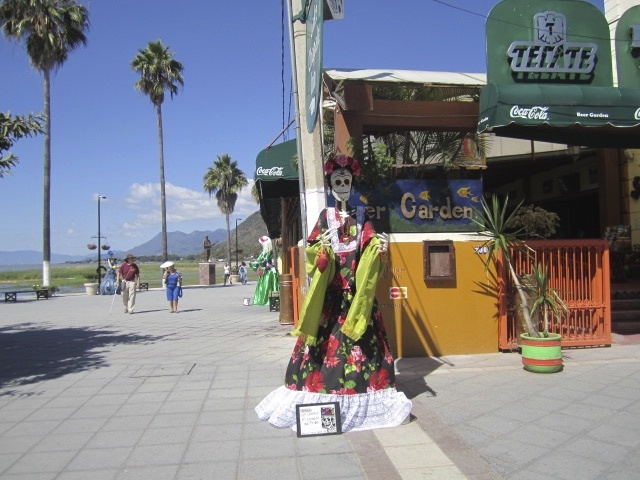 He called them La Calaca which was later changed to la Catrina. 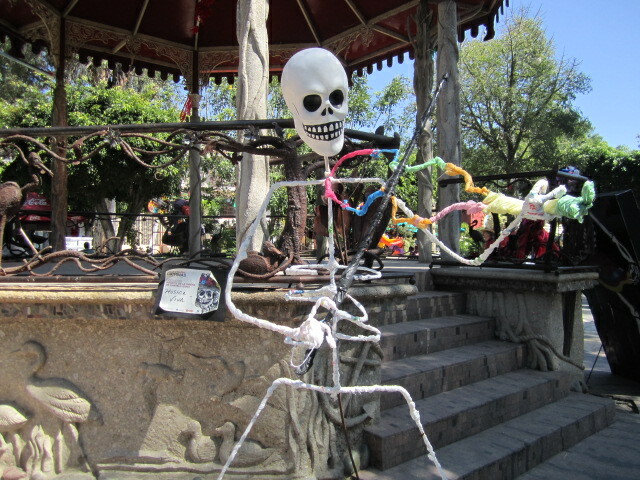 The first doll was an etching of a skeleton, Lady Posada he called it. It was also called La Calavera Gabancara which means Dapper Skeleton or Elegant Skull. 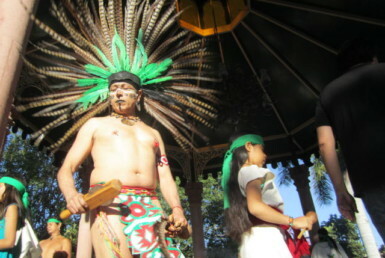 It represented the indigenous people who did not want to admit their humble origins. They were pretending to be European. Their skull faces were painted white, which also represented death. This image took off and now it is seen all over the world and the accepted symbol of the Day of the Dead. 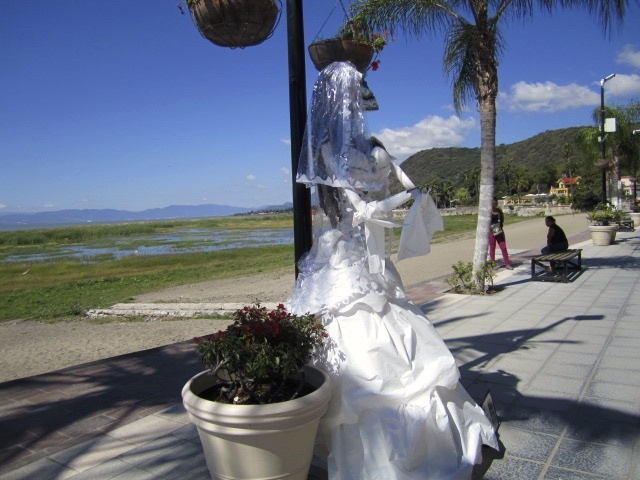 The Catrina in the above photo is located at the entrance to the wharf in Chapala. Unfortunately, I did not get the name or the creators of the one in the photo above that. The one above was created by the Prescholar Tohui. 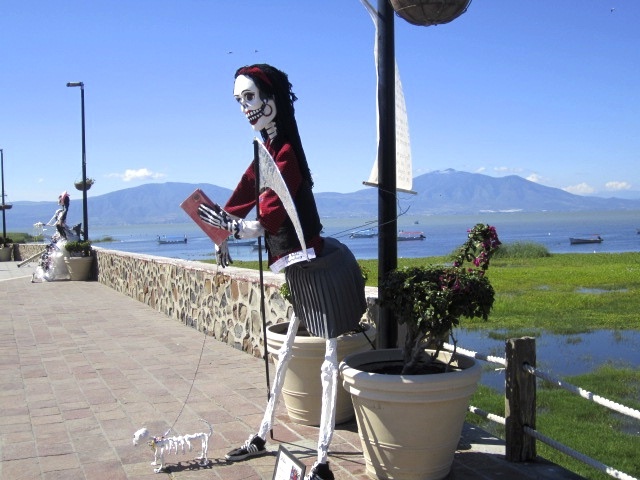 These Catrina forms were given out to the schools so they could finish them. 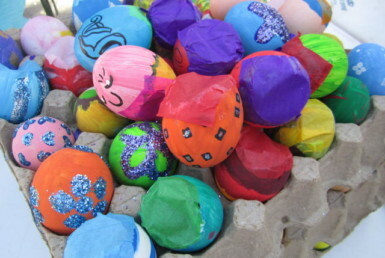 They are all made out of recycled materials or inexpensive material, such as black plastic, or paper. It is wonderful to see what fantastic Catrinas the children come up with. 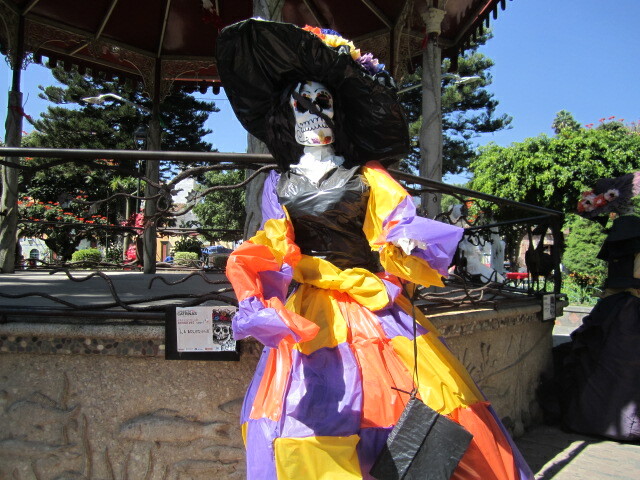 The Catrina Vaquera was made mostly out of black and white plastic. It was made by the Colegio Octavio Paz. I love the one that is in the above photo. The name on the little dog is Facebook. This was created by Primaria Juan Rulfo. 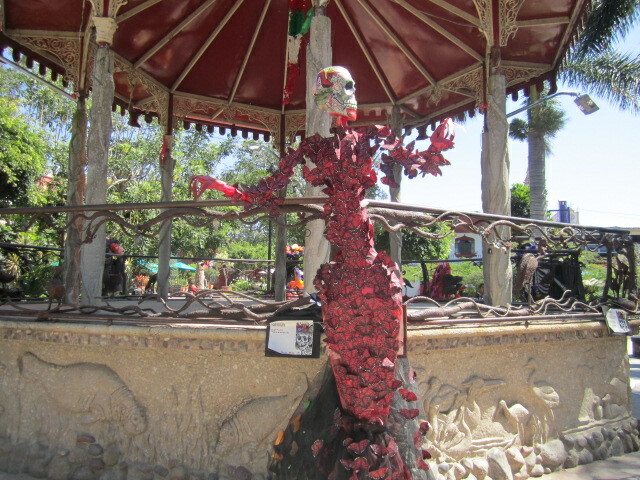 Catrina San Nicolas was created by Esc. Ninos Heroes No. 638. Great job, children. 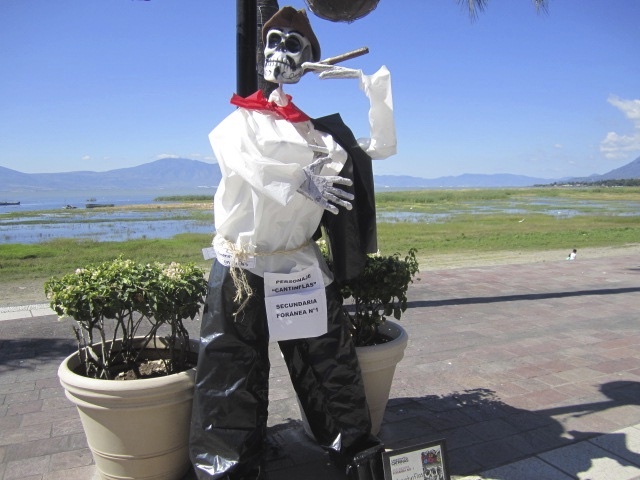 The Catrina Tarasca was by Orquesta Tipica De Chapala. 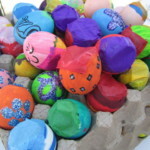 Most of it is made out of different colors of plastic. 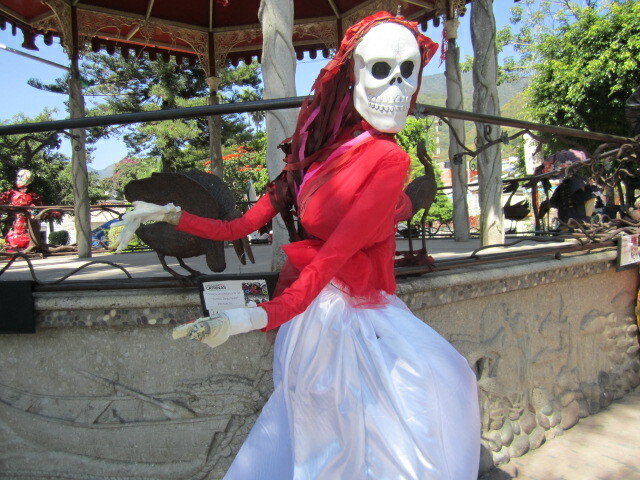 Catrina Valentina was created by Centro cultural Gonzalez Gallo. 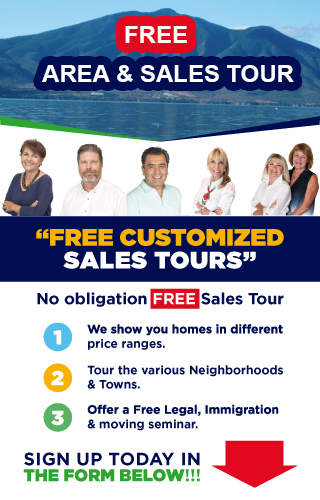 Check out the next photo. 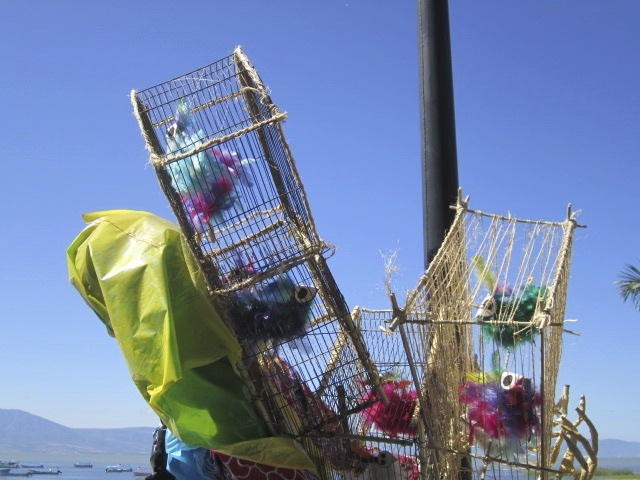 It is of the bird cages and birds she is carrying on her back. 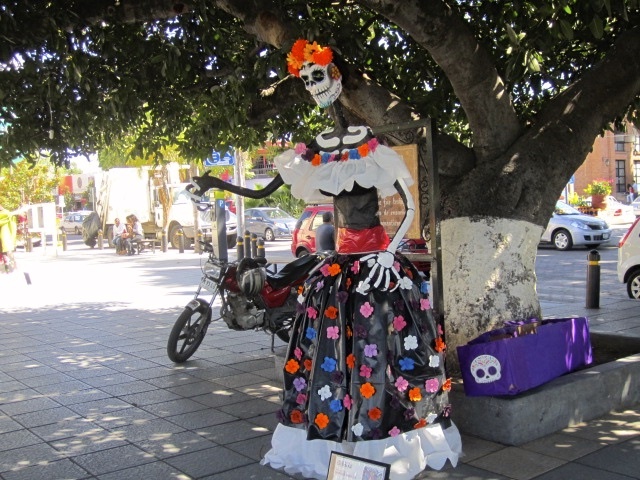 The next Catrina is of the famous artist, Frieda Kahlo. 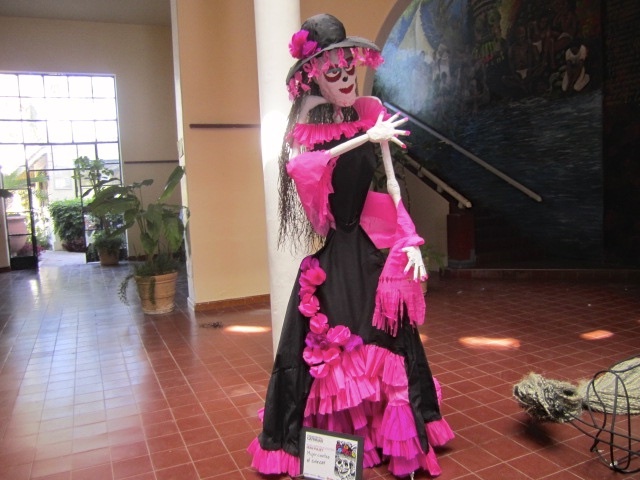 She is in every Catrina exhibit I have ever seen. 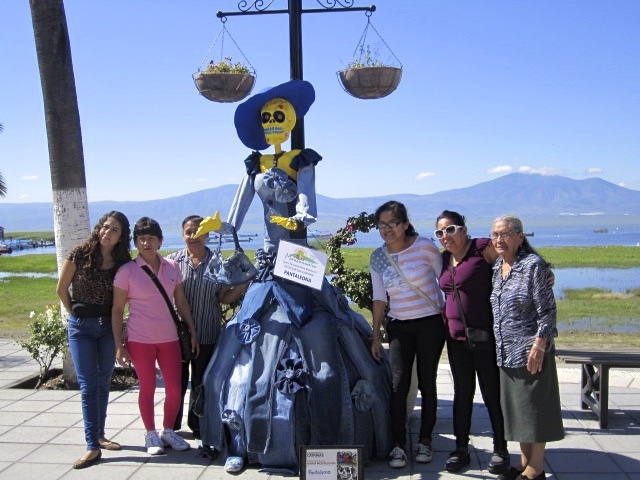 The Freida Kahlo Catrina was created by Prinaria Basilio Vadillo. 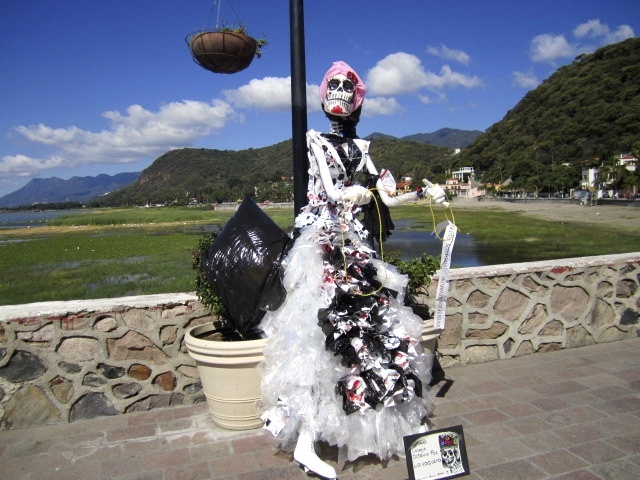 Above is a Catrina created by DIF in Chapala. Looks like another Frieda Kahlo. 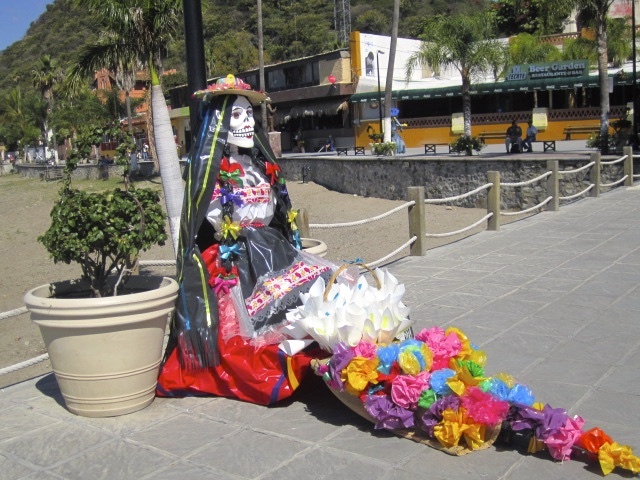 These Catrinas may have started out as a way of mocking people but now they have also evolved into a celebration of the lives of various people. I always enjoy the photos with real people in them. I like the ones where they are looking at a camera but my favorite are the ones where they are relating directly to the Catrinas. 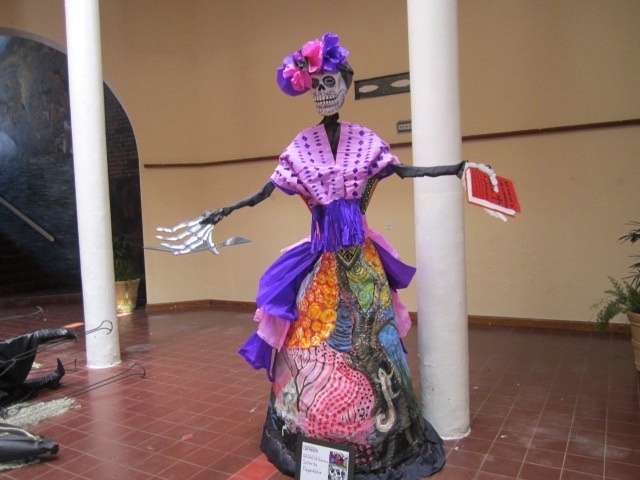 The Catrina above was created by The Montessori School. 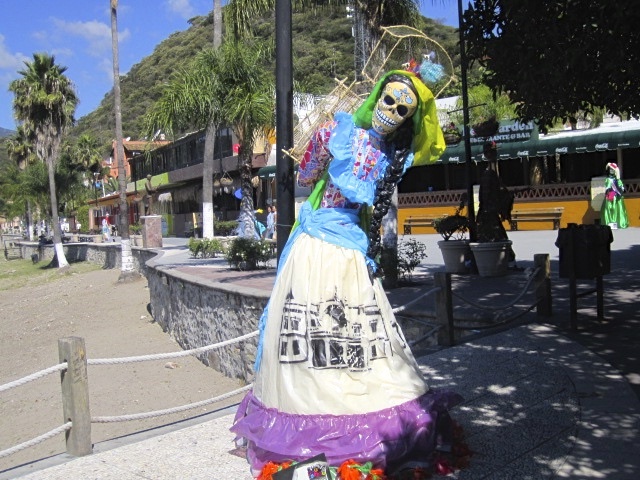 Catrina La Pirata was made by Secundaria Foranea No. 1. I like the expression on the face of the woman in the background. She seems amused. 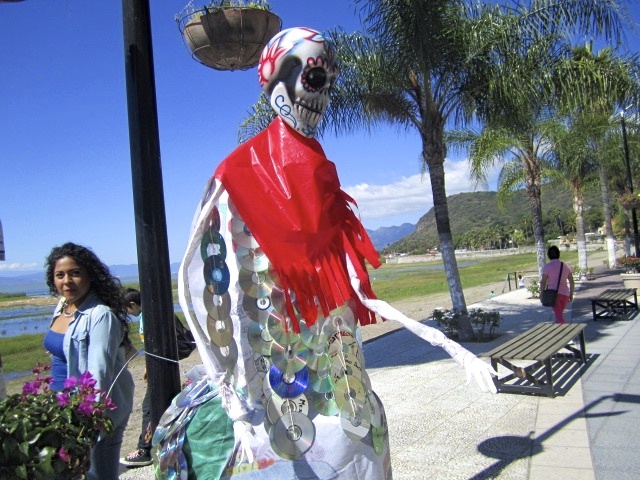 The above Catrina was created by Secundaria Foranea No. 1. I like his cigar. 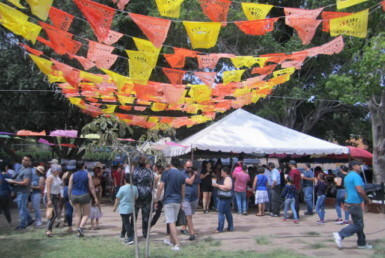 La Novia was created by Colegio Octavio Paz. Pescadora de Suenos was created by Preescolar Ricardo Flores Magon. The photo above and below were taken in the Municipal building. Unfortunately, I was getting tired and I forgot to write down the information on them. 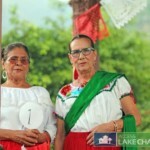 I do know that the second one is called Mujer Contra el Cancer. Woman against Cancer. Guess I should have taken a break at this point and been more careful about getting information. But I hope you enjoy the photos anyway. Maybe you can read the small signs below them. I can’t. 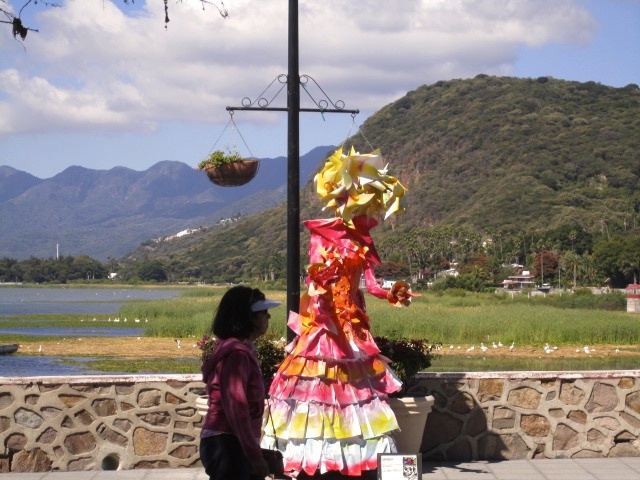 The rest of the Catrinas were in the Ajijic Plaza, around the bandstand. Not many but all very well done. As I rode the bus through San Antonio I noticed that there were a few Catrinas in their plaza. 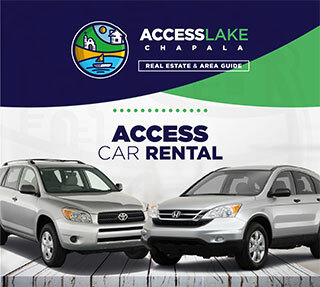 Maybe they were in all the plazas around the lake. I do not have that information. Catroma La Arlequina was created by Prescolar Cendi No. 45. I love this one where the little dog is involved in the photo. People were really enjoying posing with these Catrinas. 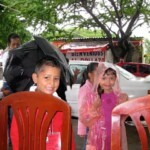 This one was created by Henneria El Tampisque Y Colectivo Lagogris. 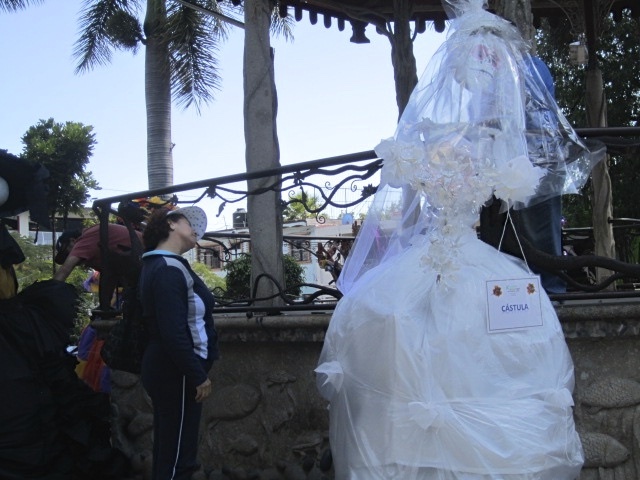 Catrina Castula was created by Prescolar Don Bosco. 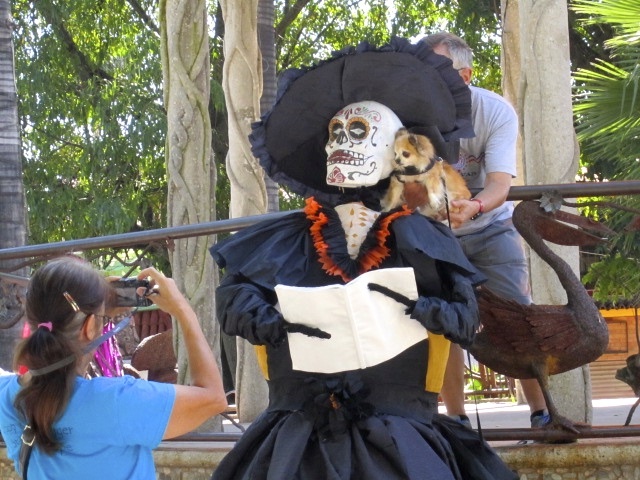 I wonder what that woman was thinking as she looked at the Catrina. 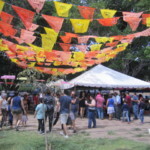 La Dichosa was created by Escuela Secundaria No. 41. I love this butterfly lady. She was created by Instituto Terranova and that was the only name she had. So we come to the end of the Catrinas. I may have missed some. Lots of people were milling about while I was taking the photos. It was very confusing. I hope you enjoyed the photos that I did get and I also hope these will inspire you to make a point of seeing them next year. It is a lot of fun.